Rev. 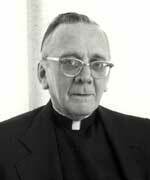 John J. Burke, CSV, died Sept. 4, 1986 in the year of his golden jubilee as a Viatorian. He was 78 years old. John Joseph Burke was born July 15, 1908 in South Boston, Massachusetts the son of Nora and Patrick Burke. He was one of five children, four boys and one girl. A brother, James, survives him. John grew up in South Boston, except for a few years as a child which he spent in Ireland with his mother and a brother. After graduating from South Boston High School in 1927 he aspired to join the Maryknoll Fathers and Brothers and began studies at their preparatory college in Pennsylvania. He left there after two years and pursued his undergraduate education at Boston College. In 1935, John traveled to the Midwest to begin his novitiate with the Viatorians in Lemont. After professing first vows in 1936 he continued studies at St. Viator College, at Normal Institute and then at St. Thomas Seminary in Denver. John returned to Boston for his ordination to the priesthood on June 12, 1943. Fr. 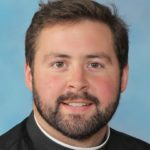 Burke began a long career of parish ministry in 1944 when he was assigned as an associate pastor to St. Viator Parish in Chicago. He was transferred to St. Patrick’s Parish in Kankakee in 1952, and after one year of service as director of the Viatorian Seminary Aid Office, Fr. Burke was appointed pastor of St. George Parish, a position which he held for 21 years. When he reached 75, Fr. Burke retired and in 1984 moved to the Province Center in Arlington Heights. A wake service was held Sept. 9, 1986 at St. Viator Parish, Chicago, followed by a funeral Mass the next morning. Fr. Burke’s body was then flown to Boston for another liturgy on Sept. 12, 1986 at Gate of Heaven Parish. After 51 years, “Boston” Burke never lost his love for his hometown. May he rest in peace.